I have seen a significant change in how Spanish consumers are learning competitive bidding and online shopping habits. An impact which we can clearly see on the biggest growing e-commerce platform in Spain — the eBay.es auction site. 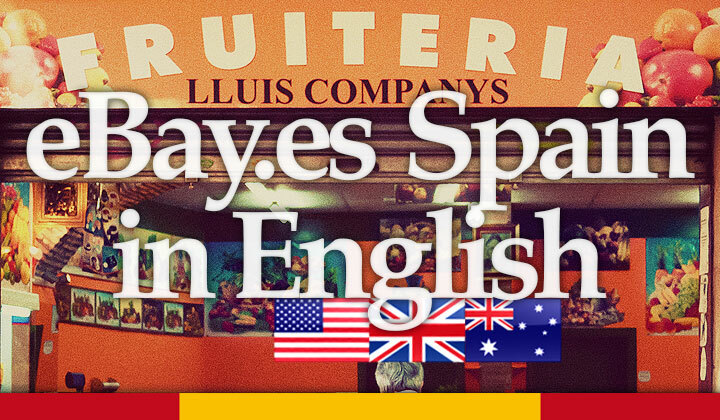 Instructions to access English eBay Spain in 2019! Note! Delivery to countries ouside of Spain is limited on the Spanish eBay.es store. To find out more, click here to see international delivery to your home country. One of the easiest ways to translate the whole eBay.es site to an English version is the web browser Google Chrome. It enables the technology of Google Translation services to make everything automatic. Just open up a page in a language that’s not your default and it will suggest you to convert the website from Spanish to English. Voila, you have an English version of eBay in your hands. If your Spanish language skills are in need for a brush up, it might be a good opportunity as well. So just think about it! From all the European countries where the American auctions giant eBay has landed, Spain has probably been the slowest in its development. But it’s clear, that the situation is changing constantly and in a really big way as customers are catching up on the benefits of their service. The most fast adopted addition to the Spanish online shopping sphere has been Amazon Spain to which eBay is still loosing big time in terms of revenue. Still the Spanish eBay already is and will increasingly be a great success story as no other company is able to come even close. And it already has been established as the meeting place of modern online sellers and auctioneers. Many great products with competitive pricing is already on their shelves by the thousandfold, bringing a long needed element of security along with it. There is no other company that can match the services of eBay. But there is still a significant population that prefer “old-school” second hand websites. So there are a few in popular use. With little security and no review system it’s a choice for those who are in for the challenge (only in Spanish). Check out segundamano.es or milanuncios.com of which the former is the most popular. Another website worth mentioning, which in fact has been acquired by eBay itself. An old classifieds website founded in Barcelona known as loquo.com which still has a bit of a buzz going on. Known for apartment rental ads in Spain but also has loads of used goods for sale. Any questions, concerns about eBay in Spain? Let me know, I’m happy to help out! Not at all! This method applies to Google Chrome only. When using that browser, it should ask you if you want to have the page automatically translated after you open ebay.es, it’s really that easy. It’s also possible with Mozilla Firefox browsers for example, but it requires the install of an add-on to have that feature. Chrome is the easiest. Hello David, I put my piano to sell through ebay.es. It’s been there for 10 days and automatically they renew my ads. Meanwhile I found a customer who wants to buy it. Please tell me can I cancel with ebay and how? (1) Go to Mi eBay (My eBay) –> Ventas (Selling) and find the item you want canceled. (2) Then from the “Más acciones” (More actions) drop-down menu, select “Finalizar mi anuncio anticipadamente” (End my listing early). Remember that you need to enter a valid reason to end the listing. (3) Finally choose “Finalizar mi anuncio” (End my listing). I want to buy my Grandson an electric sit on car ( Childs battery operated) there are loads on eBay the British site however there are many on the British site, however there are not many on the Spanish site has anyone got any ideas on how to buy a car on the British site and to get it to Lanzarote without it costing an absolute fortune. I have looked on the Spanish part of eBay and they are very few and far between, if there is a cheaper way of transporting it from the UK to Lanzarote I would be very grateful for the help or if anyone has an idea of how much it would cost as this is the only thing he has asked Father Christmas for and I don’t want to see him disappointed on Christmas Day.I would be very grateful if anyone has any idea of either a Spanish site that sells these and would deliver to Lanzarote or an English site that would deliver to Lanzarote at a reasonable rate. If anyone has any ideas I would be very grateful and would make this little boys Christmas. Don’t buy a motorized car for a child. They need the exercise they get from using the muscles needed to ride a bike or trike or scooter. Otherwise their large muscles will not develop in the same way. Yes — you should be able to do that. Thanks for your question. There is a way and I will do my best to help you find a solution. Most importantly I would need to know which web browser you are using? As I’ve mentioned in this post you will need to be using Chrome, or a browser add-on such as ‘S3.Google Translator‘ for Firefox to to do a live translation of the website. This will automatically translate most of eBay as you navigate through the pages — and most importantly all the navigation, product, payment and shipping details. But unfortunately eBay is using an “iframe” on the description of products found at the bottom. Which means that only this part cannot be automatically translated because the text is sourced from another domain. For this you have a couple of solutions. You can either (1) manually copy, paste the description to Google Translate, (2) in Firefox do a right click over the text and select ‘This Frame‘ –> ‘Open Frame in New Tab‘, or (3) to be able to do the same with Chrome, you would have to install the ‘Open Frame‘ extension from the Chrome Web Store. Please, let me know if this helped or if you have further questions! I’m afraid I can’t help you there as you’ll need to be directly in contact with eBay seller customer service for that. Have you tried contacting them? Ebay expanding to Spain is a brilliant move. There’s a lot of products abroad that we could only hope to get from using a site like Ebay. Geolocation software makes it so we can see where exactly our purchases are coming from. Access to apartment ads is a game-changer. Very helpful instructions muchas gracias! I am in Spain, I have quite a few antiques and musical instruments to sell, I tried Ebay.es, my spanish is OK but I can´t get past theshipping to list it. I get rejected every time. What can I do? attempted to sign in and identify myself the last bit was asking me to confirm my telephone number ending with 14,I now live in spain , so the number they are asking for is my old land line in Wales,and will not accept my phone number here in Spain, How do I solve it. ? I just want to BUY a Wiessmann oil fired boiler, about 25 Kw, but cannot get any sensible aswers from your diabolical website!!! Hi can we put a advert on in English. Is it then possible it can be translated to spanish ???? ?